I've seen in the new material design Side Nav spec that you can display the drawer over the action bar and behind the status bar. How can I implement this? Using Toolbar so that you can embed your action bar into your view hierarchy. Making DrawerLayout fitsSystemWindows so that it is layed out behind the system bars. Disabling Theme.Material's normal status bar coloring so that DrawerLayout can draw there instead. I'll assume that you will use the new appcompat. // Now retrieve the DrawerLayout so that we can set the status bar color. the actual layout, the desired effect will be achieved if you call fitsSystemWindows(boolean) on a view that you return from onCreateView method. EDIT: The new Design Support Library supports this and the previous method is no longer required. 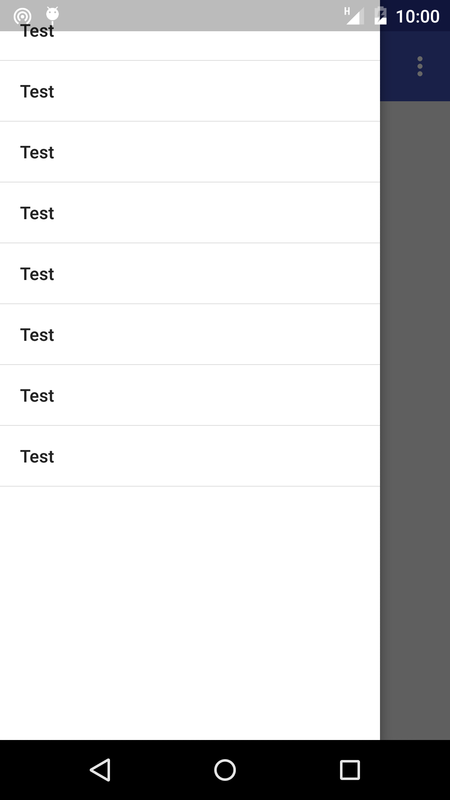 This can now be achieved using the new Android Design Support Library. You can see the Cheesesquare sample app by Chris Banes which demos all the new features. Since there is no complete solution posted, here is the way I achieved the desired result. First include a ScrimInsetsFrameLayout in your project. * based on UI chrome insets (e.g. a Google Map or a ListView). Then create a styleable so that the insetForeground can be set. Update your activity's xml file and make sure android:fitsSystemWindows is set to true on both the DrawerLayout as well as the ScrimInsetsFrameLayout. Inside the onCreate method of your activity set the status bar background color on the drawer layout. Finally update your app's theme so that the DrawerLayout is behind the status bar. 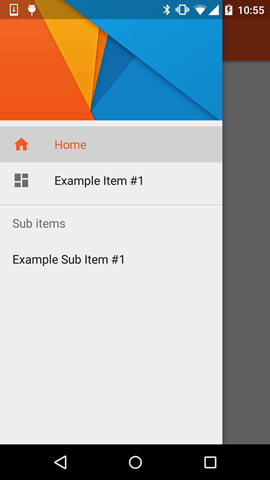 With the release of the latest Android Support Library (rev 22.2.0) we've got a Design Support Library and as part of this a new view called NavigationView. So instead of doing everything on our own with the ScrimInsetsFrameLayout and all the other stuff we simply use this view and everything is done for us. Add a Header to the NavigationView. For this simply create a new layout and add app:headerLayout="@layout/my_header_layout" to the NavigationView. I am Using Design Support Library. And just by using custom theme I achived transparent Status Bar when Opened Navigation Drawer. Do not forget to use the property, android:fitsSystemWindows="true" in "DrawerLayout"
Instead of using the ScrimInsetsFrameLayout... Isn't it easier to just add a view with a fixed height of 24dp and a background of primaryColor? I understand that this involves adding a dummy view in the hierarchy, but it seems cleaner to me. I already tried it and it's working well. Now you can onCreateOptionsMenu like as normal ActionBar with ToolBar. Hope you understand !have fun ! Not the answer you're looking for? Browse other questions tagged android navigation-drawer appcompat or ask your own question. How to make the Contextual ActionMode Bar overlay the appcompat-v7 Toolbar but not the navigation drawer? to make navigation drawer on status bar?